KOROLEV, Moscow Region (Sputnik) - Russian Soyuz MS-09 spacecraft carrying three crew members has successfully docked with the International Space Station (ISS), a Sputnik correspondent reported from the Mission Control Center. The new ISS 56/57 mission crew includes Russian cosmonaut Sergei Prokopyev, European Space Agency (ESA) astronaut Alexander Gerst and US astronaut Serena Aunon. Once the station's hatch opens, they will meet the ISS 55/56 crew comprising Russian cosmonaut Oleg Artemyev, as well as NASA astronauts and flight engineers Andrew Feustel and Richard R. Arnold. 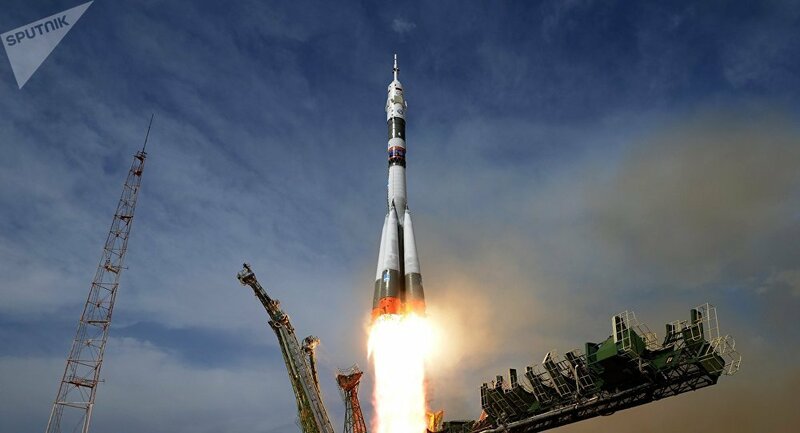 Feustel took over the command of the station from Russian cosmonaut Anton Shkaplerov, a member of the ISS 54/55 mission, who returned to Earth on June 3. Gerst will become the next ISS commander. The Soyuz-FG carrier rocket with the Soyuz MS-09 took off at 2:13 p.m. Moscow time (11:13 GMT) on Wednesday from the Baikonur cosmodrome in Kazakhstan. The new crew is scheduled to spend 187 days on the ISS.